Jeff Adams, a Brightmoor resident for the past 12 years, founded Artesian Farms, an indoor vertical farming operation that saw its first harvested crop in spring 2015. And there will be quite a bit of harvests to come, as they are scheduled to take place 17 times a year. Wanting to use agriculture to provide higher-paying jobs and food for other residents of Brightmoor, Adams evolved through a process of deciding how he wanted to do this. At first he looked into starting an aquaponics operation, but found the system of using fish waste for plant nutrients was too complex for his liking. So he opted for hydroponics, and shortly afterwards came into contact with Milan Kluko, an experienced hydroponics farmer and owner of Green Spirit Farms in New Buffalo, Michigan, located in the western side of the state. Adams and Kluko started talking, and over the next 20 months or so, developed a relationship. This led to Green Spirit Farms building vertical farming systems for Artesian Farms. These are housed in a warehouse that had been vacant since 1998, but is now the location of an indoor farm that is about to host its very first indoor harvest. The space consists of over 7,500 square feet, including 800 square feet of office space and 6,500 square feet set aside for growing food. But because the farming takes place on a vertical plane rather than a horizontal one, the growing space increases exponentially. This is where Kluko’s expertise with Green Spirit Farms comes in handy. Kluko, who has an engineering background and owns Fountainhead Engineering (with a focus on renewable energy), became interested in farming because wanted to improve the performance of the food supply chain. He realized that in order to improve sustainability and the overall agricultural ecosystem, local agriculture was a must, as was the ability to grow year-round. 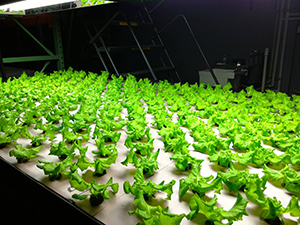 Through trial and error, Kluko has developed a unique vertical farming system that puts into use unique microenvironments, air flow and latent heat from lighting. The system, which relies heavily on induction lighting, is designed to let plants thrive on minimal energy. The collaboration between Kluko and Adams has been beneficial to both men. Green Spirit Farms will save money because now that Artesian Farms is in operation, it won’t have to deliver produce all the way from New Buffalo. And, Adams is gaining expertise in vertical farming. Green Spirit Farms trained Adams and others how to farm with their systems, and the two business work together under a license agreement. Adams raised $300,000 to get Artesian Farms off the ground, mainly through low-interest loans from foundations interested in his work and in revitalization of Detroit. As the farm expands, Adams foresees the need for more capital-raising. In addition to providing fresh greens and produce for people in the Brightmoor neighborhood, Adams is in talks with a distributor in nearby Ann Arbor who wants to distribute only Michigan products to the culinary world. So far, Artesian Farms has hired one employee—a single mom from the neighborhood. As the business grows, Adams expects to hire more employees and utilize more space. In the meantime, he’s excited about helping the neighborhood through urban farming.